We have what you need for your Sunriver or Central Oregon Vacation. 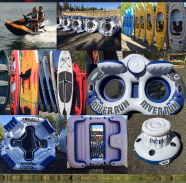 Want Float Tubes, Stand Up Paddle Boards, Kayaks, Rafts, Jet Skis, Bikes or Water Blasters? You've Found Them!!! Need the equipment over night? All our water toy and bicycle rentals are for 24 hours! Our rentals go from 9am to 9am. So you can pick up anytime during the day and return the next day at 9am for the same low Sunriver ToyHouse Toys rental rate. Come to Sunriver Toyhouse Toys and give your family the memory of a lifetime! Jet Skis - WaveRunners - 3-Person 2014 Sea Doo Spark w/jet brakes, Kawasaki 2 cycle, and more. Water Skis, Wake Board, Tow Tubes. Inner Tubes with Headrests, Netting and Cooler - For Solo Adventures, Party For Two, and Quad Tubes - Four Adults on a River Tube with a backrest and cup holders. River Rafts for Fishing, Rafts For Floating the River for 6, 4 or 2. Rental Bikes For Cruising, Bikes For Touring, Mountain Bikes, Kids Bikes 24" or 20" and 16" with Training Wheels, Kid Tag-Alongs, Infant Bike Trailers and lets not forget the Dog Bike Trailers.